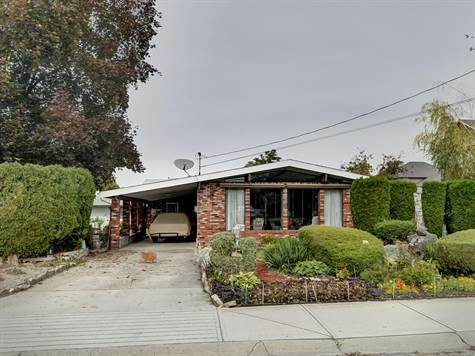 BEAUTIFUL RANCHER WITH A DETACHED GARAGE/SHOP + YARD THAT IS A GARDENERS DELIGHT!! This Home is located on a Corner Lot and features 2 Driveways and a Tandem Carport. The Home has 2 Bedrooms + 2 Bathrooms and a Den/Office with its own exterior entrance. The Kitchen features rich Oak Cabinets that overlooks the entire Living Room and there are HUGE Picture Windows facing South making this home Bright and Cheery! The Kitchen, Dining Room & Living Room also have Vaulted Ceilings making the Rooms feel large and inviting. Off the Dining Room is Family Room (could double as a Bedroom) that is cozy and has tons of windows + another Exterior Entrance making access to the backyard a breeze! This Home is perfect for almost anyone but has the added bonus of being Handicap/Wheelchair accessible. Furthermore, this Home has great Storage as there is a partial Basement + Crawl Space for all your Storage needs and a outside Staircase Entrance making it very accessible.